This article was taken from the Tallahassee Democrat Online, written by Gerald Ensley. Kenn Von Roenn recently heard an interesting fact: In one year, 600 agencies receiving at least some government money commissioned $750 million worth of art in public spaces. But here’s what concerns Von Roenn: Not a single commission went to an artist trained in creating public art. That’s because there are scant few, if any. Instead, such projects are handled by artists who learn how to create art for public buildings, parks and other areas by trial and error. That’s why Louisville-native Von Roenn returned to his alma mater, Florida State University, nearly 45 years after graduation. He wants to train artists how to create public art. 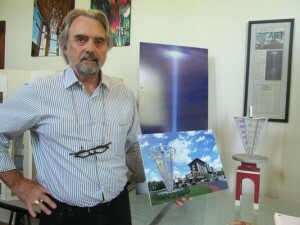 Von Roenn, 66, returned to FSU in July 2013 as director of FSU’s Master Craftsman program and associate director of its new Public Art/Architecture Art program. One of his first projects was designing the city-funded, “Declaration” steel-glass-light sculpture the Master Craftsman program will erect on Gaines Street. FSU’s public art/architecture art program is one of the first of its kind in the nation. Currently, 13 undergraduates are enrolled in the program. In September 2015, it will accept its first graduate students. Von Roenn is one of the fruits of former FSU President Eric Barron’s “entrepreneurial initiative.” Barron promoted a culture of entrepreneurship campus wide, encouraging every department to teach students how to start businesses and use their education effectively in the workplace. To that end, FSU has hired numerous “entrepreneurs in residence” such as Von Roenn, who has designed more than 1,000 public art projects worldwide. Artist rendering of “Declaration” Scultpure by Von Roenn. Von Roenn graduated in 1970 from FSU, where he was a scholarship diver. An injury short-circuited his training for the 1972 Olympics, though he returned to the sport in the 1980s and won two World Championships and 10 Masters titles. His original plan to go to law school also got waylaid when he spent a summer as a janitor in a Louisville artistic glass factory. He became a glass artist, earned a master’s in architecture from Yale University, began his own studio in Connecticut, then he returned home to take over a Louisville glass company he built into a multi-million dollar success before closing the 60-employee company to accept the FSU post. Full article can be found in the Tallahassee Democrat Website. For more information on Von Roenn, or projects like these, visit the FSU Master Craftsman Studio Website.